​“Amazing Trust” in STEP (Solo To Ensemble Project, 2015). Handbell solo with piano accompaniment incorporating NEW BRITAIN and TRUST IN JESUS. “Away In a Manger” (STEP, 2011), Arrangement of CRADLE SONG for solo handbells with piano accompaniment. 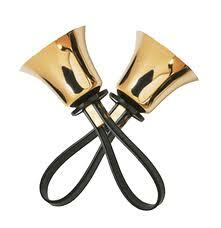 “Begin My Tongue Some Heavenly Theme” (Handbells, 2012). Arrangement of MANOAH for solo handbells with piano accompaniment. “Cracking the Case” (From the Top, Forthcoming 2017) 3 octaves bell solo with piano accompaniment. Code TBA. “A Friend For Life” (Sonology 2015) Written for and performed for a wedding, this Handbell Solo/ w piano accompaniment is appropriate for weddings or general use. “From This Day Forward” (From the Top, Forthcoming 2017) Handbell Solo/ w piano accompaniment. Written for and performed at the composer’s own wedding and subtitled “In the House of the Lord” this sensitive and flowing solo is appropriate for weddings or general use. “He Touched Me” (STEP, 2011), Arrangement of Bill Gaither tune for solo handbells with piano accompaniment. “I Love To Tell The Story” (Sonology, 2015) A flexible arrangement, this setting for Handbell Solo/Duet w piano accompaniment features the main title tune as well as hints of “Beneath the Cross of Jesus”. “Let All Mortal Flesh Keep Silence” (ring-Press, 2005) Setting of PICARDY for solo Handbells, with piano accompaniment. “Meditation for Bells” (STEP, 2009) Original composition for solo handbells with piano accompaniment. “Meditation on STILLE NACHT” (STEP, 2007) Arrangement of STILLE NACHT for solo handbells with piano accompaniment. “My Jesus, I Love Thee” (STEP, 2011), Arrangement of GORDON for solo handbells with piano accompaniment. “O Come, O Come, Emmanuel” (STEP, 2007) Arrangement of VENI EMMANUEL for solo handbells with piano accompaniment. “O Holy Night” in STEP (Solo To Ensemble Project, 1999). Handbell solo with piano accompaniment. “Rugged Cross, The” (STEP, 2007) Arrangement of “The Old Rugged Cross” for solo handbells with piano accompaniment. “Softly and Tenderly” (STEP, 2011), Arrangement of THOMPSON for solo handbells with piano accompaniment. There Is A Balm In Gilead (Sonology, 2015) This simple setting of the African-American Spiritual for Handbell Solo w/ piano accompaniment) is simple, expressive and worshipful.